While most wearables and smartwatches to date have relied upon a smartphone to do their bidding, the Neptune Suite turns the whole idea on its head. Back in February, we reported that the company was to release the Neptune Hub, a new smartwatch that was able to function independently of a smartphone. However, that was just phase one of the plan. Neptune has now outed the Suite – a laptop, tablet, smartphone and TV dongle – that are all powered by the smartwatch device. "Basically we're unveiling a whole suite of products, when you look at the current computing ecosystem we have all these devices, and we see this needless repetition of computing power within each of these products," Neptune boss Simon Tian, who dropped out of college to start Neptune at 18, told Wareable. 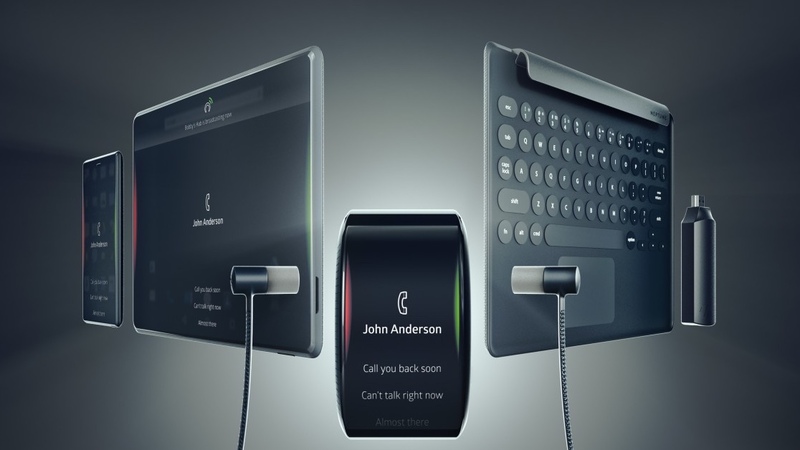 In an idea reminiscent of the Asus PadFone from 2012, the laptop, tablet and smartphone are all dumb screens, until paired with the Hub smartwatch. The brains – namely the operating system, apps, processing power – all remain on your wrist, and wirelessly beams the visuals onto the slave screens. The Suite includes a 5-inch Pocket Screen (smartphone), 10-inch Tab Screen (tablet), Neptune Keys (a wireless keyboard to use with the tablet) and the Neptune Dongle (a HDMI dongle for TVs and monitors). Oh and Tian's also throwing in a wireless Neptune Headset that won't get tangled. Because why not. "The only thing that's changing between these devices is the screen size and the input," Tian explained. "This is a new computing model where all these common denominators are put into one single unit, which you wear on your body. All the other devices become just dummy displays for use when you need them." All of the essential bits – the CPU, GPU, RAM, storage and connectivity remains on the wrist, and beams the visuals to the remote screens using a WiGig chip. To do all the processing that a laptop or smartphone would handle, the smartband will have to be plenty powerful – and its spec sheet does make for impressive reading: quad-core CPU, 64GB of storage, 4G, Wi-Fi, NFC, Bluetooth and a raft of sensors all hidden behind its 2.4-inch capacitive display. The band itself packs a 1,000mAh battery, which trumps every traditional smartwatch on the market. The company claims that the band has a battery "half the size of a smartphone" but its power consumption is also halved, thanks to the lower demands of a WiGig chip. It seems conceivable that the Duo/Hub smartwatch itself could last all day, given that it runs a full version of Android Lollipop, but we'll need to test real-life usage. Its longevity becomes increasingly important given that it holds the key to your suite. You'd think that if your Neptune Hub's battery dies, so does your laptop, tablet and phone. But each of the Suite devices pack their own batteries, too, making a combined total of 10,800mAh. And the really clever thing here is that the additional devices can act as power packs for the Hub. Tian doesn't see the evolution of the suite ending here. One day, he says, the world will be full of blank screens, which anyone can approach with the computer worn around your wrist. "The eventual vision is that the pocket screen and tablet screen are getting much cheaper, and they're interchangeable too. Screens are becoming commoditised, you can take a screen and use it as yours. Every device is yours, but no device is yours. They're all just public displays," he told us. What's more, Tian believes that computers of the future need to be worn, so they become natural parts of our lives and behaviour. "You shouldn't be plugging stuff here and there," he said. "The computing power should be an extension of your body. Like your clothes, you should put these things on and not think about them. "You can't think of it as a device that's approaching these screens, it's you as a human." You can check out the Neptune Suite at the Indiegogo page. A $199 deposit followed by another $550 when shipping gets you the entire suite of Neptune Duo band, tablet, phone, keyboard, TV dongle and the wireless headphones. If you already backed the Neptune Duo, you'll automatically receive the whole suite at no extra cost.